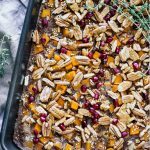 This delicious Breakfast Bake is made with butternut squash, crunchy pecans, juicy pomegranate, and quinoa. It’s the perfect combination of textures, festive fall flavors and so easy to adapt with what you have in your kitchen. If you’re stuck in a borning breakfast rut or want something special over fall in the holidays then this Butternut Squash Quinoa Breakfast Bake is for you! It’s packed with delicious flavors and textures and best of all it’s healthy too. It’s sweet, wholesome, and delicious! It’ll make your home smell heavenly! I can think of a million other reasons, but I’ll just leave it at that for now. This Maple Butternut Squash Quinoa Breakfast Bake is everything fall, winter, and holiday in a healthy breakfast! Last weekend Cody and I basically (literally) did NOTHING. It was so glorious! When was the last time you’ve taken a weekend to just sit around??? For us, it had been a really long time. The weather was cold/rainy and Cody wasn’t feeling 100%, so we decided to cancel our plans and stay in for 2 days! I’m simultaneously ashamed and proud to admit that we slept in until 10:30 or 11 both days, and didn’t change out of our pajamas until about 4pm! Yeaaaahhhhhh. Amazing, y’all. We loved our down time. It consisted of Hallmark Christmas movies all day long (Cody’s such a trooper! ), Mexican Hot Chocolate, Gingerbread Cookies, and a whole lot of cozy! 🙂 Thankfully I had made this Maple Butternut Squash Quinoa Breakfast Bake in advance, so were able to enjoy it throughout the weekend. It was delicious, y’all! This Maple Butternut Squash Quinoa Breakfast Bake is perfect for those lazy days when you want to relax and indulge in super delicious yet healthy, feel-good food. This bake is also vegetarian and gluten-free plus you can easily adapt it with your favorite fall ingredients. This recipe also has tons of pecans (yes, these are still my grandpa’s pecans that I talked about in the Pomegranate Pecan Salad w/ Cinnamon Apples recipe) and pomegranate arils (umm HI these are covered in DARK CHOCOLATE!) because they’re fabulous. Feel free to add anything else you’re loving during this holiday season! Mix the quinoa, almond milk, maple syrup, eggs, vanilla, stevia, and cinnamon together. Pour into a baking pan. Mix in the pre-cut or frozen butternut squash. Cook 15-25 minutes, making sure the bake is cooked throughout (a toothpick should come out clean). This breakfast bake looks to die for, I love the mix of flavours! Thank you, Sasha! :) That means so much! I’ve been really into butternut squash lately so think I need to try this – it looks delicious! Me too, it’s the best! 🙂 Thank you, Kathryn! This sounds wonderful. Love the idea of using quinoa for protein. A great power packed breakfast! Oh my word, this looks delicious! Thanks for sharing!